I made a few minor changes to the circuit and added them to the PC Board. The original documentation is available online here I added a bit of filtering to the noise transistor voltage supply, The voltage across the noise transistor is now the difference between V+ and V- whereas it used to be +V and ground. I added a trimmer to the circuit to adjust the noise level whereas previously this adjustment required changing a resistor. I added a resistor between the noise transistor's base and ground to improve the noise signal's symmetry. The original design works very well but I had these changes on the table for a while and it was time to re-stock the Noise Cornucopia PC boards so I made them. The changes provide a negligible improvement and while they can be fairly easily kluged into the previous PC board I don't recommend going to the trouble. The positive supply voltage is applied to the emitter of Q1 via R33 and R2, 470K resistors in series. Capacitor C18 filters the voltage applied to the emitter to reduce the possibility of supply ripple getting into the noise output. Q1's base is connected to the negative supply via R34, 10K resistor. This configuration results in more symmetry in the noise output. The noise generated at the EB junction of Q1 is capacitively coupled to the non-inverting input of U1-A which is biased to ground by R4 (2M) resistor. A gain of 48 is added by U1 and it's output is fed capacitively to adjustable gain block U1-B. 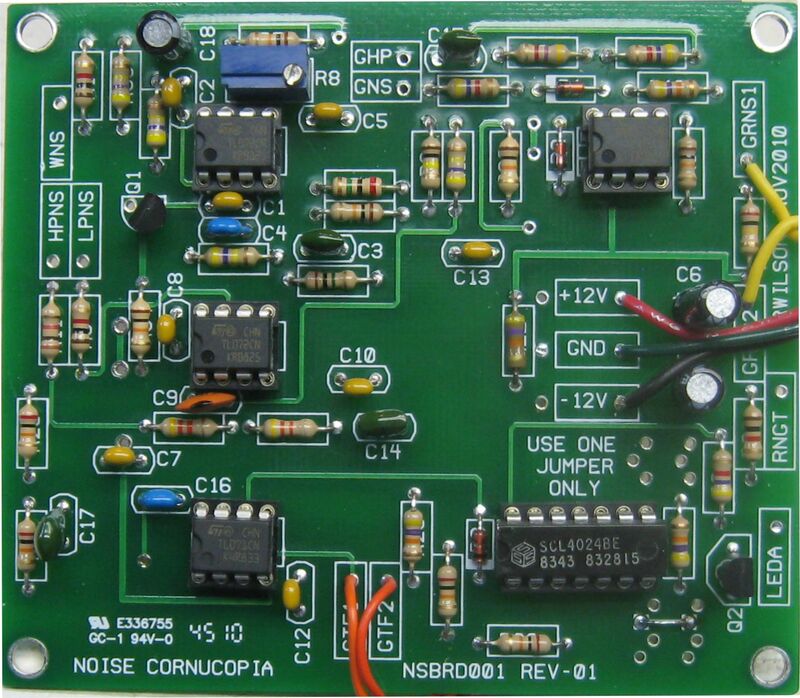 R5 is used to adjust the level of the noise at the output of U1-B to approximately +/-5V P-P. 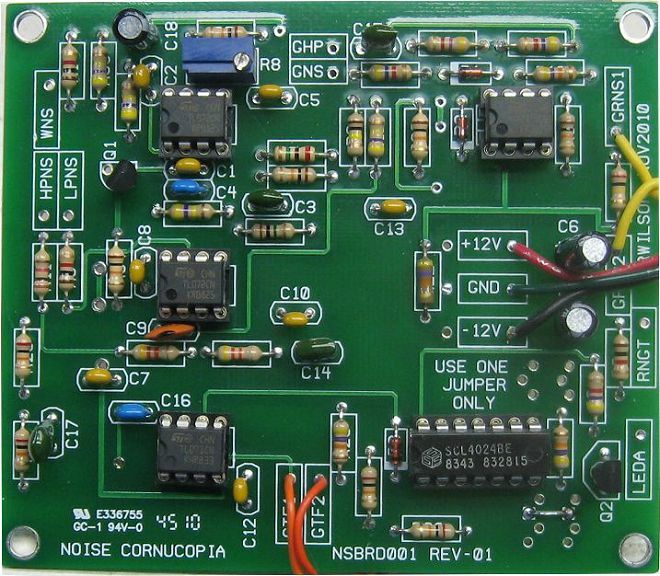 Adjust R8 for approximately +/-5V peaks in the noise signal. I found that just about any 2N3904 provided enough noise for this circuit but you may have to try a few to find the noisiest. Try to find the one that needs the least gain out of the second gain block to give you the required +/-5V P-P. The 2N5172 is another good noise transistor choice but note the difference in the pinout if you use it. If you notice that the random gates are not being output it may be that you need to reduce the value of C17 .0047 uF ceramic capacitor to .0022uF or .001uF. C17 filters out a lot of the high frequency of the noise which includes many of the large transients. If the level of the noise applied to the non-inverting input of U4 is not high enough to get over the threshold level set by R25, R38 and R21 you can also reduce the value of R31 to 18K or 15K which will reduce the level of noise necessary to exceed the threshold (lowered by lowering the value of R31). You can use a 2N3904 or a 2N5172 for the noise transistor. Select the noisiest one you can find in your parts drawer. If using the 2N3904 the transistor is inserted normally as shown here. This is because the 2N3904 pinout viewed from front is E-B-C. Cut off the collector regardless of which you use. If using the 2N5172 you need to mount the transistor as shown. This is because the 2N5712 pinout viewed from front is E-C-B. Cut off the collector regardless of which you use. NOTE - I used the 2N5172 (E-C-B) on my board.